After an incident at school incenses her to the point of allowing one of her little ‘abilities’ to slip out and be observed, Persephane’s life becomes a cascade of weird events. A fairy pleads for her help and a large bear tells her that her destiny is about to start unfolding, beginning with her first experience with the Time-Linx! It’s after this that she and her familiar Benson (a VERY cheeky dragonfly) meet Thaddeus, a wizard and his sidekick P-C (a ‘not so brave’ dragon). These four get the shock of their lives, when it’s revealed that their actual destiny together includes a dark, dangerous and on the surface – nearly impossible task. They must stop the cold and evil Melanthios from collecting nine magical objects and becoming the “All Powerful One” which would allow her and her demonic minions to rule our planet in darkness and Black Magic. Where do you find your inspiration? Reading myths and legends give me ‘seeds’ to work with. What is your favourite aspect of The Persephane Pendrake Chronicles? They are limitless, occurring in a host of magical realms. Who is your favourite character from The Persephane Pendrake Chronicles and why? Benson, definitely. He’s irreverent and reflects my personality the most. It says on the back of the first book of The Persephane Pendrake Chronicles: “About Lady Ellen – Weaving and scribing of the eight remaining tomes continues in Lady Ellen’s remote witch’s hut…on her tiny piece of Ontario’s Cambrian Shield” …and indeed that’s where the series began. After more than three decades as an alternative health care practitioner, I finally managed to start devoting some serious time to my secret love–fantasy fiction. I’ve always loved fantasy, magic and mythical kingdoms. We home-schooled our kids and lived on a 100 acre farm..which had about twenty-five acres in forest. We’d make up stories and adventures..lots of fairies, witches, wizards, etc. 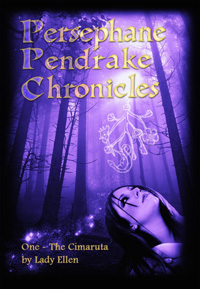 Now, all these years later, I’ve started on my nine-book, three trilogy magical series…The Persephane Pendrake Chronicles and have just re-published the first book “The Persephane Pendrake Chronicles-One-The Cimaruta. 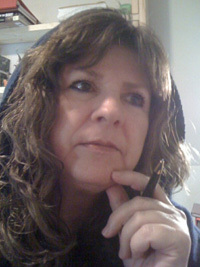 This entry was posted in Events, May 2012 - Indie Author Event and tagged author bio, buying links, interview, lady ellen, persephane pendrake chronicles, the cimaruta, website. Bookmark the permalink. Already i love the cheeky dragonfly.